Shazam! fell over 50% from last weekend and was still able to easily dominate this weekend's box office with $25.1 million. The DC movie has been receiving praise from fans and critics, who are excited about the lighter tone and family atmosphere. 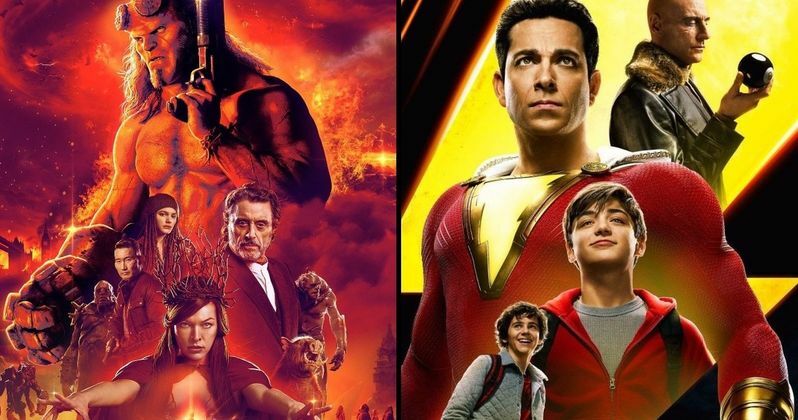 David F. Sandberg, Zachary Levi, and the young cast were able to put something honest and unique on the big screen, giving comic book fans something different from the genre. Body-swapping comedy Little stars Regina Hall, Marsai Martin, and Issa Rae debuted at number two this weekend with $15.5 million, which was more than enough to take down the Hellboy remake. The Neil Marshall-directed movie took the third position and was only able to bring in $12 million for its debut after it was expected to make anywhere from $16 million to $21 million. However, the remake has been getting torn apart by critics, though some comic book fans were satisfied with the hard R-rating and action. With that being said, the whole production was allegedly far from a pleasant experience behind-the-scenes. The Pet Sematary remake was able to dig up an additional $10 million at the box office this weekend, which was enough to earn the fourth spot. The big screen adaptation of Stephen King's iconic book has been getting positive reviews from both fans and critics, despite changes made to the source material and has brought in a grand total of $76.8 million globally it two weeks. Disney's live-action take on Dumbo took the fifth spot this weekend after bringing in $9.1 million. So far, the movie has been underperforming at the box office ever since it debuted three weeks ago and has only brought in $266.9 globally in that time. Marvel Studios' Captain Marvel continues to be a box office earner and took in $8.2 million this weekend, which was enough to take the sixth spot. The Marvel Cinematic Universe project stars Academy Award winning actress Brie Larson and recently joined the global $1 billion club as fans anticipate the upcoming Avengers: Endgame. As for the seventh spot this weekend, that went to Jordan Peele's Us, which brought in $6.9 million. College drama After debuted at number eight this weekend after bringing in $6.2 million. Like Hellboy, Laika and Annapurna's stop-motion family movie Missing Link debuted with an unimpressive $5.8 million, which earned it the ninth spot this weekend. It was originally tracking to make anywhere between $8 million and $12 million. STXfilms' civil rights drama The Best of Enemies took the tenth spot in its second weekend. The civil rights drama fell 54% to $2 million for a total of $8.1 million. You can check out the rest of this weekend's numbers over at Box Office Mojo.